George Frederick Handel – German, later British, Baroque composer. George Frideric Handel was a well-known German-British Baroque composer, and composed operas, oratorios, and instrumentals; he was born on 23rd February 1685 in Halle-upon-Saale, Duchy of Magdeburg (then part of Brandenburg-Prussia), to Georg Händel and Dorothea Taust. Although born in Halle, Germany to German parents, he spent the greater part of his working life in London, and later on, took British citizenship. 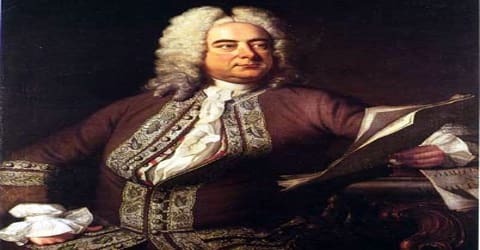 Handel received important training in Halle-upon-Saale and worked as a composer in Hamburg and Italy before settling in London in 1712; he became a naturalized British subject in 1727. He was strongly influenced both by the great composers of the Italian Baroque and by the middle-German polyphonic choral tradition. 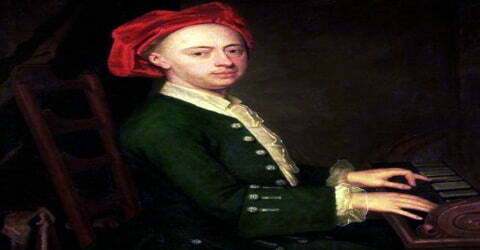 Initially kept away from musical instruments by his father, who wanted him to go into the legal profession, George Frideric Handel learned to play keyboard instruments secretly. Later, he had formal lessons from Friedrich Wilhelm Zachow, then a church organist at Halle, on the suggestion of Johann Adolf I, Duke of Saxe-Weissenfels, whose words his father could not disobey. In 1705, Handel made his debut as an opera composer with Almira. He produced several operas with the Royal Academy of Music in England before forming the New Royal Academy of Music in 1727. When Italian operas fell out of fashion, he started composing oratorios, including his most famous, Messiah. One of his four coronation anthems, Zadok the Priest (1727), composed for the coronation of George II, has been performed at every subsequent British coronation, traditionally during the sovereign’s anointing. Another of his English oratorios, Solomon (1748), has also remained popular, with the Sinfonia that opens act 3 (known more commonly as “The Arrival of the Queen of Sheba”) featuring at the 2012 London Olympics opening ceremony. Handel composed more than forty operas in over thirty years, and since the late 1960s, with the revival of baroque music and historically informed musical performance, interest in Handel’s operas has grown. Even as a student, he began to take up his master’s duties and started composing church music. Later he moved to Hamburg and then to Italy before being appointed a Kapellmeister at Hanover. But within a year he visited London, where his ‘Rinaldo’, an Italian opera specially composed for London, was received with great enthusiasm. Very soon, he received royal patronage and thereafter, except for a short sojourn at Hanover, he remained at London, continuing to produce operas and oratorios all most till the end of his life. 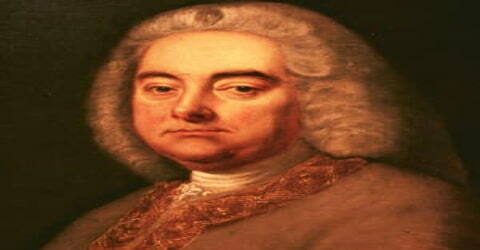 After his success with Messiah (1742), Handel never composed an Italian opera again. Almost blind, and having lived in England for nearly fifty years, he died in 1759, a respected and rich man. His funeral was given full state honors, and he was buried in Westminster Abbey in London. 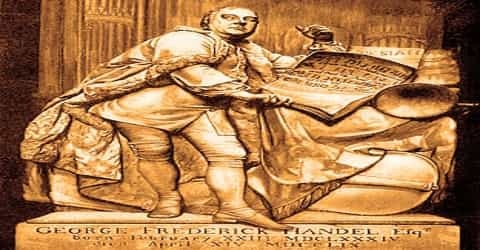 George Frideric (or Frederick) Handel was born on 23 February 1685 in Halle-on-Saal, Duchy of Magdeburg, at that time a province of Brandenburg-Prussia, as Georg Friedrich Händel. His father, also Georg Händel, was a barber-surgeon, serving in the court of Saxe-Weissenfels and the Margraviate of Brandenburg. His mother, Dorothea Taust, was his father’s second wife. Daughter of a Lutheran Pastor, she bore her husband three children. Among them, George Frideric Handel was the eldest and he had two younger sisters named Dorothea Sophia and Johanna Christiana. From an early age, Handel longed to study music, but his father objected, doubting that music would be a realistic source of income. In fact, his father would not even permit him to own a musical instrument. His mother, however, was supportive, and she encouraged him to develop his musical talent. With her cooperation, Handel took to practicing on the sly. Handel also had six half-siblings, Dorothea Elisabet, Gottfried, Christoph, Anna Barbara, Karl, Sophia Rosina, from his father’s first marriage to Anna Belching. Early in his life, Handel is reported to have attended the gymnasium in Halle, where the headmaster, Johann Praetorius, was reputed to be an ardent musician. Whether Handel remained there or for how long is unknown, but many biographers suggest that he was withdrawn from school by his father. He also made sure no musical instrument entered his house and forbade young Handel from visiting any house that had one. According to many of his biographers, he now managed to install a small clavichord in the attic with his mother’s help and practiced there when his father went to sleep. But very soon, a visit to Weissenfels, at the age of nine, changed the situation for the better. 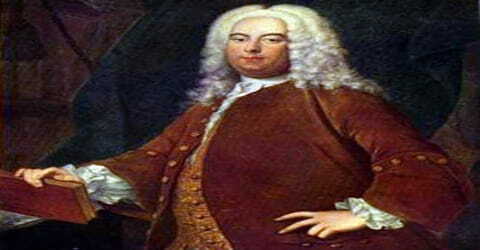 Sometime between the ages of seven and nine, Handel accompanied his father to Weissenfels where he came under the notice of one whom Handel thereafter always regarded throughout life as his benefactor, Duke Johann Adolf I. Somehow Handel made his way to the court organ in the palace chapel of the Holy Trinity, where he surprised everyone with his playing. Overhearing this performance and noting the youth of the performer caused the Duke, whose suggestions were not to be disregarded, to recommend to Georg Händel that Handel is given musical instruction. Being a church organist, Zachow belonged to the old school and was proficient in fugues, canons, and counterpoint. Concurrently, he was also aware of the developments across Europe. 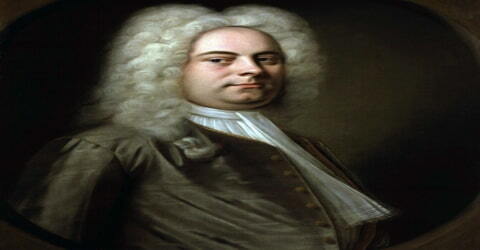 As he discovered Handel’s potential, he introduced him to all kinds of music. Handel not only studied composition with him but also learned to play different instruments like harpsichord, violin, organ, and oboe. It is not known when, but very soon, he began taking his teacher’s place in the church services, composing music for the organ. His father died on 11 February 1697, a few days before his twelfth birthday. Despite his dedication to music, he continued his education, matriculating sometime in 17/01/1702. During this period, he wrote many church music, but they are now lost. In 1703, when Handel was 18 years old, he decided to commit himself completely to music, accepting a violinist’s position at the Hamburg Opera’s Goose Market Theater. During this time, he supplemented his income by teaching private music lessons in his free time, passing on what he had learned from Zachow. Handel never married and kept his personal life private. His initial will bequeathed the bulk of his estate to his niece Johanna, however, four codicils distributed much of his estate to other relations, servants, friends, and charities. Towards the end of the 1740s, Handel began to have eye problems, possibly cataract. Although he had it operated, by 1752, he lost his vision completely. Yet, he continued to work till the end. 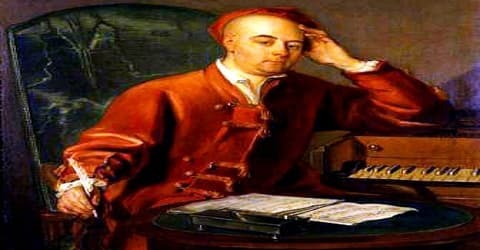 On 10 February 1702, in deference to his father’s wishes, Handel enrolled at the University of Halle to study law, but music remained his main passion. On13 March, he was appointed organist at the Domkirche, a Calvinist Cathedral, for an honorarium of 5 thalers a year and free lodging. Though working as a violinist, it was Handel’s skill on the organ and harpsichord that began to earn him attention and landed him more opportunities to perform in operas. Handel also began to compose operas, making his debut in early 1705 with ‘Der in Krohnen erlangte Glücks-Wechsel, oder: Almira, Königin von Castilien’. The opera was instantly successful and achieved a 20-performance run. After composing several more popular operas, in 1706 Handel decided to try his luck in Italy. While in there, Handel composed the operas Rodrigo and Agrippina, which were produced in 1707 and 1709 respectively. He also managed to write more than a few dramatic chambers works during this period. During his stay at Hamburg, he also wrote ‘Der beglückte Florindo’ and ‘Die verwandelte Daphne’ at the request of Reinhard Keiser, the manager of the Hamburg Opera. But in 1706, before they could be premiered, he left for Italy at the invitation of either Ferdinando de’ Medici or Gian Gastone de’ Medici. In Italy, Handel met librettist Antonio Salvi, with whom he later collaborated. Handel left for Rome and since opera was (temporarily) banned in the Papal States, composed sacred music for the Roman clergy. His famous Dixit Dominus (1707) is from this era. He also composed cantatas in pastoral style for musical gatherings in the palaces of cardinals Pietro Ottoboni, Benedetto Pamphili and Carlo Colonna. Two oratorios, La resurrezione, and Il trionfo del tempo, were produced in a private setting for Ruspoli and Ottoboni in 1709 and 1710, respectively. Rodrigo, his first all-Italian opera, was produced in the Cocomero theatre in Florence in 1707. Agrippina was first produced in 1709 at Teatro San Giovanni Grisostomo, owned by the Grimanis. The opera, with a libretto by Cardinal Vincenzo Grimani, ran for 27 nights successively. The audience, thunderstruck with the grandeur and sublimity of his style, applauded for Il Caro Sassone (“the dear Saxon” – referring to Handel’s German origins). 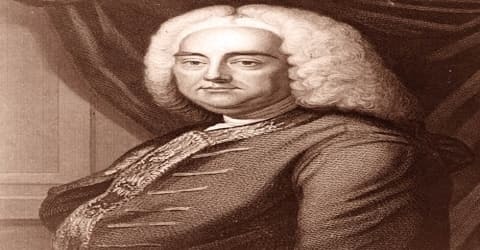 George Frideric Handel remained in Italy for approximately three opera seasons, visiting major cities like Florence, Venice, Rome, and Naples, meeting notable musicians like Arcangelo Corelli and Alessandro Scarlatti and his son Domenico. Simultaneously, he continued writing music. Touring the major Italian cities over three opera seasons, Handel introduced himself to most of Italy’s major musicians. Unexpectedly, while in Venice, he met multiple people who expressed an interest in London’s music scene. Enticed to experiment with a freelance music career there, in 1710 Handel left Venice and set out for London. In London, Handel met with the manager of the King’s Theatre, who commissioned Handel to write an opera. Within just two weeks, Handel composed Rinaldo. Released during the 1710–11 London opera season, Rinaldo was Handel’s breakthrough. His most critically acclaimed work up to that date, it gained him the widespread recognition that he would maintain throughout the rest of his musical career. Most important among them were two operas, ‘Rodrigo’, written in 1707 and ‘Agrippina’ in 1709. Among the two, ‘Agrippina’ was especially successful, running twenty-seven performance successively. Other than them, he also wrote several chamber works and sacred compositions, which became equally popular. In 1710, Handel became Kapellmeister to German prince George, the Elector of Hanover, who in 1714 would become King George I of Great Britain and Ireland. He visited Anna Maria Luisa de’ Medici and her husband in Düsseldorf on his way to London in 1710. With his opera Rinaldo, based on La Gerusalemme Liberata by the Italian poet Torquato Tasso, Handel enjoyed great success, although it was composed quickly, with many borrowings from his older Italian works. This work contains one of Handel’s favorite arias, Cara Sposa, Amante cara, and the famous Lascia ch’io pianga. Interested in a freelance career, George Frideric Handel set out for London sometime towards the end of 1710. There on 24 February 1711, Handel had his ‘Rinaldo’, an Italian opera specially composed for London premiered. It was greeted with great enthusiasm. Handel realized that he could have a successful career in England. Handel now began to learn English. However, he could not yet cut off his ties with Germany, having to return to Hanover by the middle of 1711. In October 1712, he once again returned to London on condition that he should return to Hanover within a reasonable time. In the summer of 1713, he lived at Mr. Mathew Andrews’ estate in Barn Elms, Surrey. He received a yearly income of £200 from Queen Anne after composing for her the Utrecht Te Deum and Jubilate, first performed in 1713. One of his most important patrons was The 3rd Earl of Burlington and 4th Earl of Cork, a young and extremely wealthy member of an Anglo-Irish aristocratic family. While living in the mansion of Lord Burlington, Handel wrote Amadigi di Gaula, a “magic” opera, about a damsel in distress, based on the tragedy by Antoine Houdar de la Motte. On 10 January 1713, he had his operas ‘Teseo’ produced. Shortly, he also completed, ‘Il pastor fido’, ‘Utrecht Te Deum’ and ‘Birthday Ode for Queen Anne’. The conception of an opera as a coherent structure was slow to capture Handel’s imagination and he composed no operas for five years. In July 1717 Handel’s Water Music was performed more than three times on the River Thames for the King and his guests. It is said the compositions spurred reconciliation between Handel and the King, supposedly annoyed by the composer’s abandonment of his Hanover post. In 1719, Handel was invited to become the Master of the Orchestra at the Royal Academy of Music, the first Italian opera company in London. Handel eagerly accepted. He produced several operas with the Royal Academy of Music that, while well-liked, were not especially lucrative for the struggling academy. Initially, Handel did not have any permanent address. Around 1715, he was invited by the 3rd Earl of Burlington and 4th Earl of Cork to live in his Burlington House in Piccadilly, London. While living there he wrote ‘Amadigi di Gaula’ for the Earl. In 1717 Handel became house composer at Cannons in Middlesex, where he laid the cornerstone for his future choral compositions in the twelve Chandos Anthems. From August 1717 to February 1719, he lived in the country estate of Duke of Carnarvon, writing music for him. The twelve ‘Chandos Anthems’ and ‘Acis and Galatea’ are some of the major works of this period. In 1719 the Duke of Chandos became one of the composer’s important patrons and main subscribers to his new opera company, the Royal Academy of Music, but his patronage declined after Chandos lost money in the South Sea bubble, which burst in 1720 in one of history’s greatest financial cataclysms. Handel himself invested in South Sea stock in 1716, when prices were low and sold before 1720. By 1723, Handel set up his own establishment in a house he rented at 25 Brook Street. Except for a few visits to Germany, he lived in this house till his death around twenty-six years later, continuing to create music. During twelve months between 1724 and 1725, Handel wrote three outstanding and successful operas, Giulio Cesare, Tamerlano and Rodelinda. Handel’s operas are filled with da capo arias, such as Svegliatevi nel core. After composing Silete venti, he concentrated on opera and stopped writing cantatas. Scipio, from which the regimental slow march of the British Grenadier Guards is derived, was performed as a stopgap, waiting for the arrival of Faustina Bordoni. In 1726, Handel decided to make London his home permanently and became a British citizen. (He also Anglicized his name at this time, to George Frideric.) In 1727, when Handel’s latest opera, Alessandro, was being performed, Italian opera in London took a hard hit as the result of a hostile rivalry between two female lead singers. Frustrated, Handel broke away from the Royal Academy and formed his own new company, calling it the New Royal Academy of Music. Under the New Royal Academy of Music, Handel produced two operas a year for the next decade, but Italian opera fell increasingly out of style in London. He composed two more Italian operas before finally deciding to abandon the failing genre. In around 1728, Royal Academy of Music closed down. Handel now opened his own company. But around this time, as Gay’s Beggar’s Opera opened in London, the popularity of Italian opera, in which Handel specialized, began to fall. Although he refused to forsake it, he also started working on oratorios. In 1729 Handel became joint manager of the theatre with John James Heidegger. He traveled to Italy to engage new singers and also composed seven more operas, among them the comic masterpiece Partenope and the “magic” opera Orlando. After two commercially successful English oratorios Esther and Deborah, he was able to invest again in the South Sea Company. Handel reworked his Acis and Galatea which then became his most successful work ever. Handel failed to compete with the Opera of the Nobility, who engaged musicians such as Johann Adolph Hasse, Nicolo Porpora and the famous castrato Farinelli. The strong support by Frederick, Prince of Wales caused conflicts in the royal family. In 1732, Handel revived ‘Esther’, which he had written in 1718 while living in Cannons, into a full oratorio. Its success led him to produce two more oratorios; ‘Deborah’ on 17 March 1733 and ‘Athalia’ on 10 July 1733. I had Lady Rich and her daughter, Lady Cath. Hanmer and her husband, Mr. and Mrs. Percival, Sir John Stanley and my brother, Mrs. Donellan, Strada (star soprano of Handel’s operas) and Mr. Coot. Lord Shaftesbury begged of Mr. Percival to bring him, and being a profess’d friend of Mr. Handel (who was there also) was admitted; I never was so well entertained at an opera! Mr. Handel was in the best humor in the world, and played lessons and accompanied Strada and all the ladies that sang from seven o’clock till eleven. I gave them tea and coffee, and about half an hour after nine had a salver brought in of chocolate, mulled white wine and biscuits. Everybody was easy and seemed pleased. In the Lent of 1735, he produced fourteen concerts, made up mostly of oratorios. Concurrently, in spite of suffering losses, he continued to produce Italian operas, resulting in his opera company going bankrupt in 1737 and himself suffering a stroke. In 1741 Dublin’s Lord Lieutenant commissioned Handel to write a new oratorio based on a biblical libretto assembled by art patron Charles Jennens. As a result, Handel’s most famous oratorio, Messiah, made its debut at the New Music Hall in Dublin in April 1742. In 1749 Handel composed Music for the Royal Fireworks; 12,000 people attended the first performance. In 1750 he arranged a performance of Messiah to benefit the Foundling Hospital. The performance was considered a great success and was followed by annual concerts that continued throughout his life. In recognition of his patronage, Handel was made a governor of the Hospital the day after his initial concert. He bequeathed a copy of Messiah to the institution upon his death. George Frederick Handel continued to compose a long string of oratorios throughout the remainder of his life and career. These included Semele (1744), Joseph and His Brethren (1744), Hercules (1745), Belshazzar (1745), Occasional Oratorio (1746), Judas Maccabeus (1747), Joshua (1748), Alexander Balus (1748), Susanna (1749), Solomon (1749), Theodora (1750), The Choice of Hercules (1751), Jeptha (1752) and The Triumph of Time and Truth (1757). In around 2000, the house he rented at 25 Brook Street in London was acquired and restored by Handel House Trust. In the following year, it was turned into Handel House Museum, which is now open to public six days a week. In the spring of 1737, Handel suffered a stroke that impaired the movement of his right hand. But after only six weeks of recuperation in Aix-la-Chapelle, Handel was fully recovered. He went back to London and not only returned to composing, but made a comeback at playing the organ as well. Six years later, Handel suffered a second springtime stroke. However, he stunned audiences once again with a speedy recovery, followed by a prolific stream of ambitious oratorios. Handel died in 1759 at home in Brook Street, at age 74. The last performance he attended was of Messiah. Handel was buried in Westminster Abbey. More than three thousand mourners attended his funeral, which was given full state honors. George Frideric Handel is best remembered for his 1741 work, ‘Messiah’, an English-language oratorio based on the life of Jesus Christ. The text was drawn both from Old and New Testament, with the final chorus from Book of Revelation. Source of the popular ‘Hallelujah Chorus’, it is one of the most frequently performed oratorios. The original form of his name, Georg Friedrich Händel, is generally used in Germany and elsewhere, but he is known as “Haendel” in France. A different composer, Jacob Handl or Händl (1550–1591) is usually known by the Latin form Jacobus Gallus that appears in his publications.